Hey Lovelies!!! In this post, I share what it means to dress confidently especially when it come to tackling my career. This post is a collaboration with Dress for Success and ShopStyle in an effort to promote and give to a very worthy cause. I am apart of a group of style bloggers that are participating in ShopStyle's Bloggers Give Campaign. During the short promotion period of December 8-9, 2015 I will be donating 10% of all sales from my blog to Dress for Success, and PopSugar, Inc. through ShopStyle will match 100% of my contribution (more info here). Now that all of that is out of the way let's talk about how fabulous this light pink leather skirt from Zara is. The skirt is a unique color and I just love the A line style of it. Very flattering. 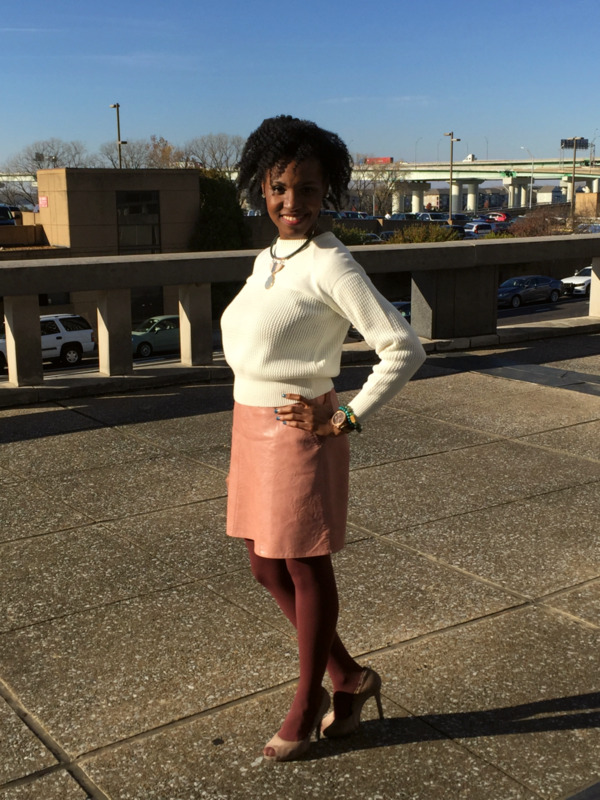 I paired my skirt with the cutest shrunken sweater. I scored the sweater at the Goodwill for about $2.99. It has a very 1960s inspired look, and I figured it would pair nicely with several pieces in my wardrobe. Fun tights, and neutral shoes complete the look perfectly. In this outfit I feel like I am Something Old, Something New - the brand. I am wearing both thrifted (the sweater) and current (skirt form Zara) clothing, and I am completely confident in myself. This look is my Power Outfit. A power outfit isn't about wearing a black or navy suit; my power outfit is about being 100% unapologetically myself. As a young child I was encouraged by my grandmother to explore style options, and to not be a conformist. That piece of advice is ever-present in my world...and wardrobe. Hope you guys enjoyed this post, and more importantly I hope all of you guys support #BloggersGive. For more information on Dress for Success and their mission, please check out there website at www.dressforsuccess.org (link here).